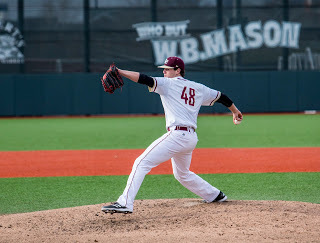 BC High's Mike Vasil has the Eagles' ascending to number one in our top 25 poll. After a couple of weeks of poor weather and bad field conditions, the baseball season got into the swing of things last week. With the season now well underway, here is SuiteSports' first updated MIAA Baseball Top 25 Poll as selected by our panel of writers, correspondents, and editors. 1. Boston College High (3-1; Preseason Poll: 4) Led by Mike Vasil and Sean O'Connell the Eagles have already picked up quality wins over St. John's Prep, St. John's Shrewsbury, and Braintree. As a whole, BC High's pitching staff has surrendered just two earned runs in four games. 2. Braintree (2-1; Preseason Poll: 5) The two-time Super Eight champions have impressed early on, picking up an opening season win over Newton North before coming up 90 feet short versus BC High. Jackson Duffy is turning into one of the top players in the Bay State. 3. Wachusett (4-0; Preseason Poll: 7) Mountaineers proved they have plenty of pitching depth when Barry Walsh took the mound on Thursday and threw a complete game to lead Wachusett past Catholic Memorial, 4-3. 4. Central Catholic (4-1; Preseason Poll: 1) Raiders had a hiccup versus Catholic Memorial, but picked up a quality 4-0 win over Austin Prep on Saturday. Steve Hajjar has wasted little time showing why he is one of the most valued players in the region. 5. Newton North (3-1; Preseason Poll: 6) Kenny Schecter has the makings of a legit number one starter while Cole Whitehouse and Dante Taylor are the fulcrum of a lineup that looks to be coming around. 6. Austin Prep (4-1; Preseason Poll: 8) Despite a 4-0 loss to Central Catholic, the Cougars have shown early on that they will be in the mix all season long. 7. Lexington (4-0; Preseason Poll: 11) The Minutemen have taken care of business early on. A big early season matchup with Belmont looms on Monday. 8. Brookline (5-1; Preseason Poll: 23) Brookline has a lock down 1-2 to lead a standout rotation in Silas Reed and Casey Wisel. A test on Monday versus Newton North is sure to be interesting. 9. St. John’s Shrewsbury (3-2; Preseason Poll: 2) Pioneers showcased some of their youth in a pair of early season losses to Algonquin and BC High, but bounced back to knock off Doherty and Nashoba. Nick McDonald is proving to be one of the top arms in the junior class. 10. Catholic Memorial (4-3; Preseason Poll: NR) Knights came out of the gate red-hot with wins over BC High, St. John’s Prep, Central Catholic, and Xaverian before falling to Wachsuett and Newton North. Colin McGrath has yet to let up an earned run in league play. 11. Belmont (2-1; Preseason Poll: 9) Marauders had a slip up versus Woburn at the end of last week, but will have to quickly turn the page with a battle with Lexington scheduled for Monday. Ace Nate Espelin is scheduled to take the mound. 12. Taunton (6-0; Preseason Poll: NR) So far this season the Tigers are proving to be the class of the Hockomock Kelly-Rex. Jack Moynihan was nothing short of dominant in Taunton’s win over Franklin striking out 15 hitters while allowing just three hits. 13. Mansfield (4-1; Preseason Poll: NR) Preseason intrigue surrounding the Hornets’ rotation has come to fruition so far this season with the staff allowing just seven runs in five games. 14. Xaverian (4-3; Preseason Poll: 13) No one has had more ups and downs to begin the year than Xaverian. The Hawks dropped to 2-3 after three consecutive losses to CM, Mansfield, and Walpole but have responded with a walk-off win over Norwood and a win at Fenway Park over Catholic Conference rival St. John’s Prep. 15. St. John’s Prep (3-3; Preseason Poll: 3) Eagles have showcased plenty of pitching depth and that’s with Dan Regan and Max Gieg still on the way. The question remains whether they have the offense to complement those arms. 16. North Andover (4-0; Preseason Poll: NR) The Scarlet Knights are off to a fast start with Justin Connolly producing at the plate to go with John McElroy and Sebastian Keane on the mound. 17. Swampscott (4-0; Preseason Poll: NR) It may still be early, but Swampscott has proven to be the team to beat in the Northeast Conference already this season. The Big Blue have already knocked off Lynn Classical and handed Beverly its only loss. 18. Andover (2-1; Last Week: 12) A loss to Lincoln-Sudbury at the end of last week prevents from the Golden Warriors from jumping in our poll. Still, this staff led by Josh Gruenberg has already shown it will help Andover compete for a Merrimack Valley Conference title. 19. Minnechaug (5-1; Preseason: NR) Minnechaug started off its season in style with a 5-4, extra inning win over Algonquin before heading out east and showcasing its ability to compete state-wide with a 4-2 win over Walpole. A 7-6 loss for Ludlow is the only hiccup on the docket so far. 20. Plymouth North (5-0; Preseason Poll: 18) So far the benefits of being a veteran team are paying off for Dwayne Follette’s club. The Eagles are off to a 5-0 start including a critical win over Silver Lake. 21. Silver Lake (5-1; Preseason Poll: 16)Lakers succumbed to a late Plymouth North rally in the opening round of the Brad Martin Tournament, but overall are off to a solid start. 22. Reading (2-1; Preseason Poll: NR) Due to weather Reading has yet to have the chance to showcase its full potential, but a 10-5 win over Wilmington displayed signs that the Rockets are sure to be a contender once again in 2018. 23. Brockton (4-1; Preseason: Poll: NR) The Boxers have surprised many in the early going with freshman Chris Carbona leading a team that has quality wins over Catholic Memorial and Brookline to its name. 24. Franklin (4-2; Preseason Poll: 16) There is little question about the quality of Franklin’s pitching staff. The Panthers have surrendered just 10 runs through their first three games of the season. 25. Beverly (4-1; Preseason Poll: NR) Outside of a loss to Swampscott, Beverly is proving to be a top dog in the Northeast Conference early with wins over Danvers and Lynn Classical.